Being healthy includes achieving and maintaining the correct weight. Herbalife Shakes made with delicious Formula 1 Shake Mix can help you attain this. Whether you have one shake a day as part of a healthy meal, or two shakes a day as part of your weight loss programme, you can trust Formula 1 to deliver the perfect healthy solution. Each serving of Herbalife Formula 1 contains 9 grams of high quality, non-GM soy and whey protein and will help you feel full and satisfied. It’s rich in vitamins and now contains the added benefit of Aminogen, a naturally derived ingredient that helps the body break down food protein into free-form amino acids. 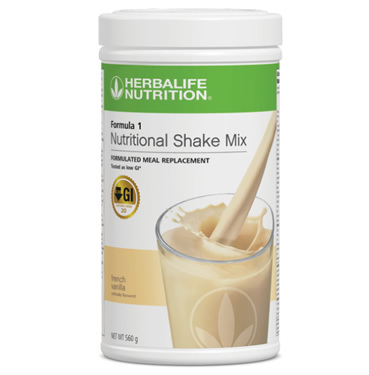 Herbalife Formula 1 Nutritional Shake Mix is tested as a low GI. GI value is for powder only and the values are - Vanilla 20, Chocolate 19, Berry Flavour 21 and Cookies n’ Cream 15. Low in calories, with only 205 calories (or 857 kilojoules) when mixed with 300mL skim milk, Formula 1 shakes are a great option if you are looking to build lean muscle mass along with exercise. Soy and Whey - Each serving provides 9g of protein, helping to keep the body's protein requirements balanced and to minimise muscle wastage during periods of weight loss. A, Thiamin, Riboflavin, Cyanocabalanin, B6, Niacin, Ascorbic Acid, Cholecalciferol, E, Folate, Biotin, Pantothenic Acid, K.
Calcium, Iodine, Iron, Phosphorous, Magnesium, Zinc, Manganese. Calcium Casseinate - a calcium source which may be more suitable for those with lactose intolerance. A naturally-derived ingredient that helps the body break down food protein into free-form amino acids which are better absorbed by the body. Low in Calories, only 205 calories per serving when mixed in 30ml skim milk. Low in saturated and unsaturated fat. Rich in minerals and vitamins A, C and E, that can help fight free radical oxygen molecules and so help protect your body. Formula 1 has been developed to provide a scientifically-balanced and easily absorbed source of quality nutrition. Easy to prepare, either shake by hand is a sealed flask, use a mini blender or electric blender. The final product froths up readily and has a smooth, creamy consistency. Create your own shake recipes, or use our Formula 1 Shake Recipes, by adding fresh or frozen fruit and ice. Blend or stir 28g of Formula 1 with 300 ml of skim milk, soy milk, rice milk or oat milk. Add fresh or frozen fruit and ice as desired.